Baby Loss Awareness Week..Baby Loss Awareness Week is annually recognised across the world, from the 9th to the 15th of October. It is an opportunity for bereaved parents, and their families and friends, to unite with others across the world to commemorate the lives of their little loved ones. It is a key time to raise awareness of the issues that surround baby loss in the UK, and to push for tangible improvements in services, support, research and policy around bereavement care. Baby Loss Awareness Week concludes each year on International Pregnancy and Infant Loss Remembrance Day, October 15th - with the global ‘Wave of Light’. 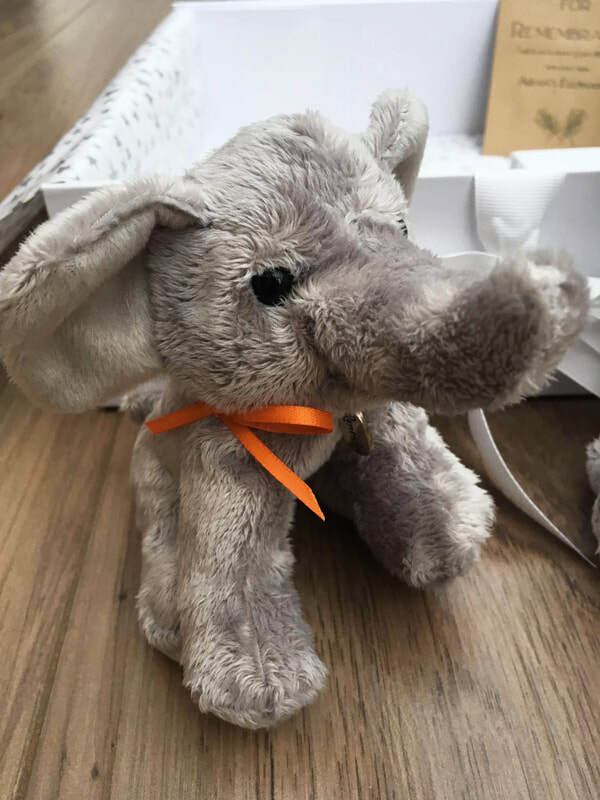 During Baby Loss Awareness Week, Aidan's Elephants is joining forces with over 40 other charities and non profit organisations, to raise public awareness of key issues that affect those who have lost a baby or young child. Together we are committed to raising awareness of pregnancy and baby loss, identifying how we can reduce preventable deaths and improve support for all those affected. Our shared aim is to remove the 'postcode lottery' of receiving good care when a baby dies. We believe that every hospital where baby death occurs should have an appointed person to lead on bereavement care. We are calling for bereavement rooms/suites for parents to be available and accessible in every hospital. We want to see all health and social care professionals receiving the highest standard of bereavement care training. Ultimately, we want every UK hospital to be required, without exception, to provide outstanding bereavement care for parents. Our Role in Baby Loss Awareness Week 2018. We want to improve care for bereaved parents. In order to provide good care it is vital that medical professionals, employers, family, friends - all understand what good care looks like to parents who have experienced the death of their baby. We are encouraging all Aidan's Elephants supporters to talk about what good care means to them, on the main Baby Loss Awareness Website. Having information in one key place means that anyone wanting to provide good care has easy access to a wealth of invaluable information and experience. If you feel able to, please submit your story here. We are supporting the joint charities' 'Break the Silence' campaign, by encouraging our supporters to share their stories or short video blogs on the Baby Loss Awareness Website. We will be posting (on our Facebook and Twitter pages) an awareness graphic every day during Baby Loss Awareness Week. The graphics can be shared on social media to open up conversations and break the silence around losing a baby. We are also encouraging all our supporters to write to their local representatives and ask them to raise awareness of baby loss and to help push for improvements in bereavement care and support following loss. You can download a template letter/email here. If you would like any help in finding your local representative, or in writing to them, please get in touch with us. If you use Twitter or Facebook, you may like to add a ‘Twibbon’ to your profile picture. You could also post a message explaining what it represents, adding the hashtags #babyloss and #breakthesilence. There are many events taking place during Babyloss Awareness Week. The Baby Loss Awareness Week charity partners, along with members of the All Party Parliamentary Group on Babyloss, have organised events at Westminster and in the devolved parliaments, along with smaller events throughout the UK. You can find information about all the listed Baby Loss Awareness Week events here. The Sunbeam Support Group have organised a 'Wave of Light' event in the beautiful new Sunbeam Garden (baby remembrance garden)'. You can find more details here. Thanks to the staff and supporters of Baby Loss Awareness Charity Partners, public buildings and landmarks will be lit up in pink and blue to mark Babyloss Awareness Week. You can find details of the participating buildings and landmarks here. As one of over 40 charities and non profit organisations who are involved with Baby Loss Awareness Week, Aidan's Elephants has been invited to attend the parliamentary launch of Baby Loss Awareness Week 2017, and a Remembrance Service for guests of the APPG (All Party Parliamentary Group) on Baby Loss. Both events are held in the Houses of Parliament. on Wednesday 11th October. We have asked Bev Beaumont (Bereavement Midwife, Airedale Hospital) and Gemma Sayer (Midwife, Airedale Hospital) to take our seats at both events, to represent the Bereavement Care partnership between Aidan's Elephants and Airedale NHS Foundation Trust. Every year, on October 15 (International Pregnancy and Infant Loss Awareness Day), people from around the world are invited to light a candle or candles, at 7 p.m. local time, creating a Wave of Light in memory of babies who have died too soon. All our Memory Boxes contain an engraved glass tealight holder, which can be used for lighting a candle for your baby for the Wave of Light (and for lighting a candle at any other time). Anyone can join a digital Wave of Light from 7pm on 15 October by posting a photo of their candle to Facebook or Twitter with the hashtag #WaveOfLight. We also provide a Wave of Light graphic on our social media channels every year, which families can share to request that family and friends light a candle for their little loved one(s).